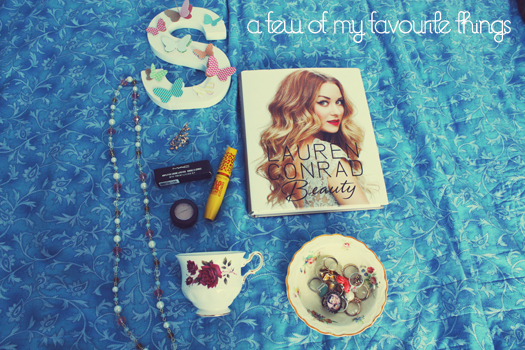 ♥ Necklace & Ring from Lovisa. I've been wearing my studded & bedazzled Forever New necklace to death lately so it was time for a new necklace. 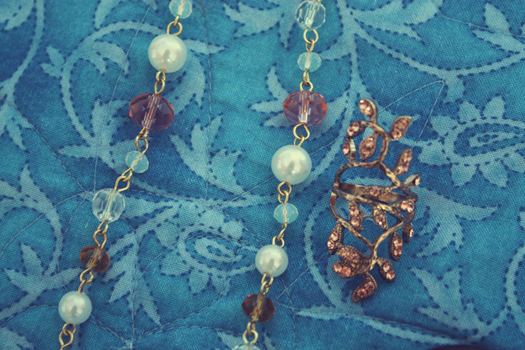 I love the combination of coloured beads mixed in with the pearls in this necklace. It looks really pretty on. The ring is so so pretty as well! As you know I love rose gold & statement jewellery, in particular rings so I had to get this. Lovisa always have such beautiful, inexpensive pieces. ♥ Mac Amplified Creme Lipstick in Show Orchid, available from Mac Pro stores. This was a Fleur De Force inspired purchase. The colour is a bright fuschia pink with tiny blue shimmery particles throughout. I was quite scared by this colour in the tube but once I'd tried it on I was sold. It feels very moisturising on the lips & it lasted a good 6 hours before I needed to touch up the colour. The colour is so beautiful on as well, it's like a lipstick with the sparkle of a gloss-perfect in other words. 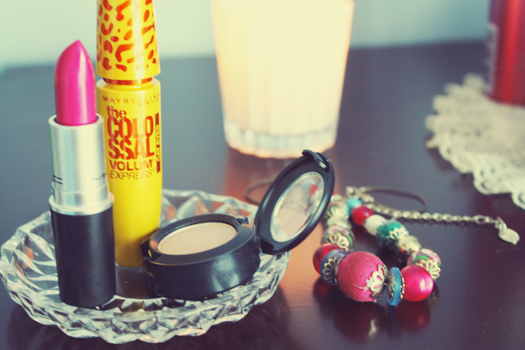 ♥ Maybelline the Colossal Volum Express Cat Eyes Mascara, gifted. This mascara is great for creating naturally flared, defined lashes without looking overdone during the daytime. It is very easy to apply & the wand is curved which makes it easier to flick out the lashes on the outer corner. This mascara would look perfect with winged liquid eyeliner. ♥ Mac Naked Lunch Eyeshadow. Again, another inspired purchase, this time by Tanya Burr. Neutral shadows are so pretty, especially if they have a hint of sparkle like this one does. It looks beautiful blended with Woodwinked or A Natural Flirt. If you're after a great neutral shadow then definitely give this a try. 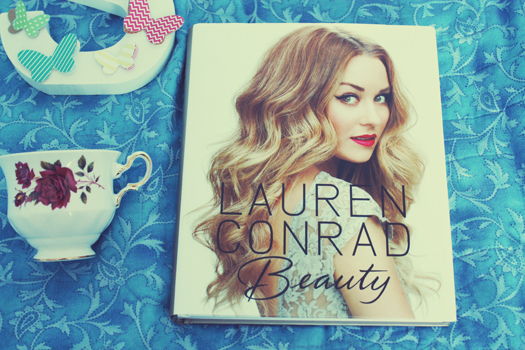 ♥ Lauren Conrad Beauty. I've been a fan of Lauren's since she had the dream Teen Vogue internship back in her days on The Hills. 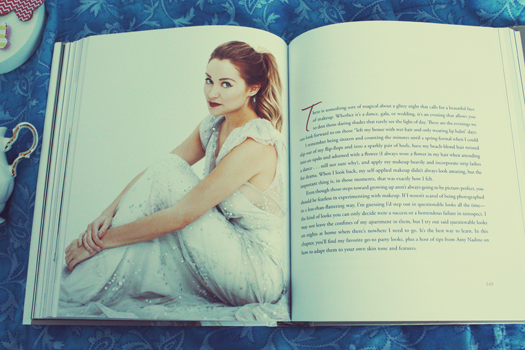 Since she departed the show she's proved herself as a true role model & inspiration for women all over the world. This book is a comprehensive beauty guide covering topics from dealing with stress to creating the perfect party makeup looks. The step by step guides are very easy to follow & understand. There are great tips throughout the book as well. I'd highly recommend it. ♥ I hope you all have Marvellous Mondays! You may have noticed my layout looks quite different. Feel free to check out some of the new features & let me know what you think. Now listening to: I Love It by Icona Pop. So catchy, don't try to tell me you aren't tempted to dance around the room when you hear it.